POLICE COMMISSION MEETINGS 2019: January 24 (DB), February 28 (NBB), March 28 (CB), April 22 (DB), May 30 (NBB), June 27 (CB), July 22 (DB), August 26 (NBB), September 26 (CB), October 28 (DB), November 25 (NBB), and December 19 (CB). All meetings will begin at 7:00 PM. Venues (CB) Chalfont Borough Municipal Building , 40 N. Main Street, Chalfont; (DB) Doylestown Borough Hall, 57 W. Court Street, Doylestown; (NBB) New Britain Borough Burkhart Hall, 45 Keeley Avenue, New Britain. Meetings are open to the public. FINANCE AND ADMINISTARTION COMMITTEE MEETINGS 2019: January 17, February 21, March 21, April 18, May 16, June 20, July 18, August 15, September 19, October 17, November 21, and December 12. All meetings will begin at 6:00 PM and are held at the Doylestown Borough Municipal Building, 57 W. Court Street. Meetings are open to the public. 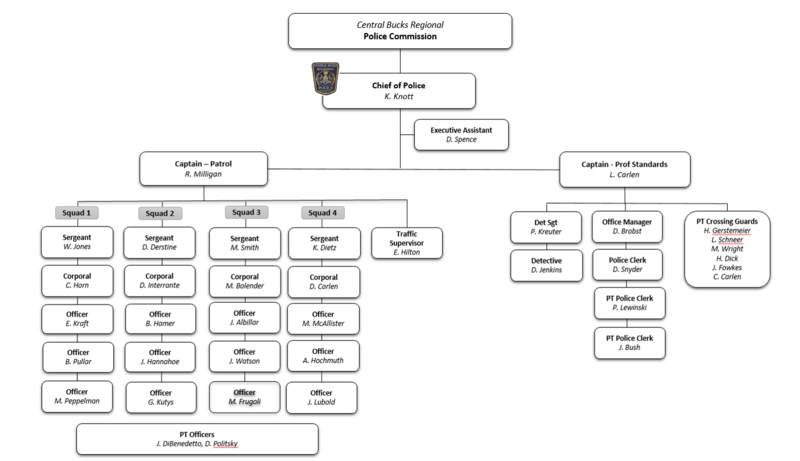 CBRPD is a full service regional police department. Police Officers are available 24 hours a day, 7 days a week. The Administrative Office operates Monday through Friday, 8:30 am to 5:00 pm. After hours, Officers can be reached through their voicemail by dialing 215-345-4143 or by calling the Radio Room at 215-348-3524. The new website, with more information, can be found through the CrimeWatch link below. For addtional information and policies click HERE. Requests may be faxed, emailed or delivered in person. CBRPD follows the RTKL and all regulations associated with it. The fee for reports is $15.00 per report.